There’s been quite a bit of news lately about how the Protection 1 Team has been quickly gaining market share and successfully managing a number of major national retail conversions. Methodically, deliberately, and successfully they’ve been focused on delivering a new model to the industry, one that takes advantage of their 26 years of strength and their nationwide infrastructure. With a new leadership team brought in a few years ago, comprised of a number of retail subject matter experts, Protection 1 started a developmental process. They knew all too well what the retailers needed and the pitfalls the industry can face using third party sub-contractors to implement a large project. With an existing nationwide award-winning group of consultants and service technicians, they brought in a leader, Brendan Smith, as their Vice President of Field Operations. His task: take the best of the best and develop a National Account “Seal Team”, totally dedicated and driven to making it “Right the First Time”, one retailer at a time. 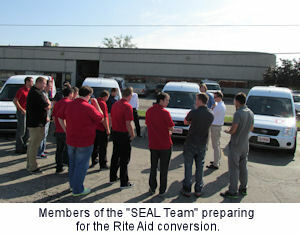 The first retailer to experience the Seal Team at work was Rite Aid. National Account Manager Jim Shepherd worked with the Rite Aid team on a plan to upgrade the alarm systems at all of their stores and prepare them for an IT-enabled future. Next, leading from the front, Brendan and other senior leaders selected 16 of the best of the best from their existing team and rolled up their own sleeves to help reinvent the installation process from the front lines. 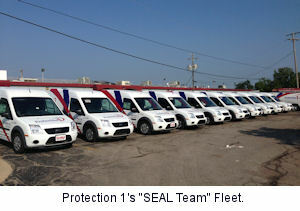 Armed with this high energy mobile Seal Team, Protection 1 pioneered a new installation model. A team totally dedicated to spreading out across the nation and delivering the same custom solution at each of a customer’s locations, with consistent quality each and every time. Staffed with team members who take pride in “Mastering their Trade” and led by a leader who values their contributions and works along side of them, this “Seal Team” has put the doubters to rest - and the retailers they’ve converted are singing their praises. Converting thousands of stores in record time is not the pace for many. But it is for the Seal Team, and Brendan Smith’s team isn’t ringing the bell. Quite the contrary, they’re just getting started. It takes pride and dedication to travel the country installing systems with a commitment to consistency and quality, and it takes a passionate and strong leader to get it done. Well done Seal Team and Brendan Smith.